You can find the core element information you need for most types of sources in the source's "front matter". What is your use of this source? Are you citing a portion of a work, like a chapter or preface? Are you citing a film because of a discussion within the text of your paper of the film's director, writer, or actor? Is the original publication date relevant? Is the publishing location important to your use of the source? Is your source a unique kind of source like a transcript or speech? A source can have one or two containers. Some sources are complete in themselves. They are not part of a larger container. A print novel is an example of a source that stands alone and is not part of any container. It is its own container so the title of the novel is placed in Core Element 3: Title of source, is italicized, and followed by a period. If the work you are citing is part of a larger whole, like a chapter in a book, then the book containing the chapter is a container. 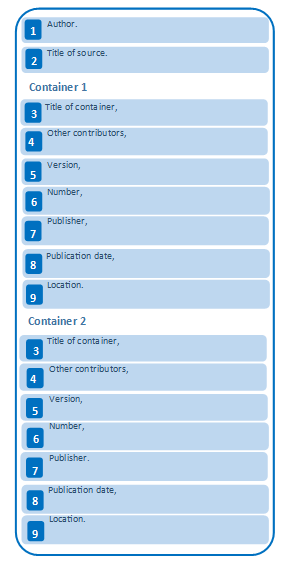 The chapter title is Core Element 2: Title of source and the book is Core Element 3: Title of container. The book chapter title is in quotation marks and followed by a period. The book title is italicized and followed by a comma. Some sources are part of two containers. If you are citing a journal article you obtained through a database, for example, you will need to use two containers in your citation. The article is contained in the journal, making the journal the first container. 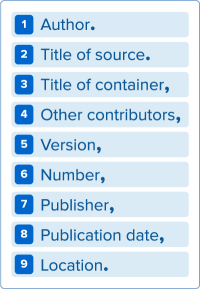 The journal is contained in a database, making the database the second container. List the pertinent core elements for the first container (e.g. journal) followed by the pertinent core elements from title of container through to location again for the second container (e.g. database). Now create your citation with the order of the core elements and correct punctuation and italics in mind. Capitalize the first word in the citation and any words directly after periods. End the Works Cited entry with a period, regardless of which Core Element comes last in your individual citation. The MLA Style Center walks writers through the creation of Works Cited entries. View their quick guide and download their practice template.